My family works so hard to support the family. My father was the drunk man in the village, while he was drunk he argued with my mom and is often violent, but he was the main supporter of the family. My father passed away when I was in 4th grade. My family was in depression and is getting poorer and poorer. I have had asthma since I was in 5th grade, it bothers me during my studies. My mother also got sick when I was in 9th grade. She started getting worse and the provincial hospital told us that she needed surgery in Phnom Penh. When I reached grades 10 through 12, it was even more difficult for me to attend schools because I needed to pay more. I always worked in a factory to earn money in order to support my studies and family during my summers. I could earn about $150 per month but I did not have any opportunities to study. So far, I have encountered endless difficulties and even now it is still difficult. All of my past difficulties have made me stronger so that I can overcome any obstacle. 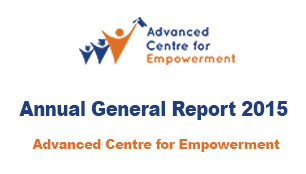 Now I have been given an opportunity to study and stay in Advanced Centre for Empowerment (ACE). I am so happy because ACE has helped me to support some of my livelihood. Also, I can have a better future through many trainings that are provided here. I am committed to myself, and my future and I will work hard with ACE and outside to earn money in order to attend a university to achieve my goal and become an English teacher.